The Egyptian revolution of 2011, is a term which refers to a period of significant political upheaval which occurred in Egypt. Following from and inspired by the Jasmine Revolution , or more properly the Sidi Bouzid revolt, in Tunisia , on 25 January 2011 Egypt experienced the first moments of the revolution that would see Mubarak removed from power. On what was called the "Day of Anger" or "Day of Revolt", protests broke out in Cairo , Alexandria , El-Mahalla El-Kubra , Aswan , and Ismaïlia . Organised through social networking groups, as well as by word of mouth, tens of thousands of people took to the streets, with most of the protesters concentrated in Cairo and Alexandria. The size of the protest in Cairo was much larger than the police expected it to be and so, as a result of this, the protesters were able to break out of the cordon that the police had placed them in and head to Tahrir Square which, in the days to come, would become the focal point for a protest movement seeking democratic reform in Egypt. Although the police deployed tear gas and water cannon and initially succeeded in dispersing the protesters, this tactic ultimately failed and the police were eventually forced to retreat from the protesters as they came under bombardment from stones. 1.3 1 February - "March of the Millions"
On 26 and 27 January clashes continued between the police and protesters with live ammunition now being deployed, alongside tear gas and water cannon. Although the clashes quietened slightly on 27 January this would change on the following day, the day of jumu'ah or Friday prayer. On 28 January, which became known as the "Day of Rage" or "Friday of Anger", the Egyptian government shut down internet services just prior to 01:00 in an attempt to remove the protest organizers' means of communication and to blunt the upcoming protests. This move failed, partially due to the fact that some people were still able to communicate using a text-to-speech telephone service operated between Google and Twitter. Once Friday prayers ended tens of thousands of people took to the streets of the main cities of Egypt to continue the pro-democracy protest against Mubarak. After a matter of hours the number of protesters rose until hundreds of thousands of people were on the streets. Mohamed ElBaradei flew from Giza to Cairo to join the protests where he was promptly placed under house arrest. This obviously didn't work as Mohamed ElBaradei was then to go on and, in a later interview with Al-Jazeera , state that he was unaware of his house arrest. It probably helped that, as a result of his arrest, the US decided to review the amount of aid it was willing to continue giving to Egypt, or more specifically, the Egyptian military and the people at the top, which was mostly the Egyptian military anyway, and so El-Baradei was promptly released. The police response to the numbers of people protesting in Eqypt was to continue with pretty much the same tactics (tear gas, water cannon, rubber bullets and something that just screams riot control, buckshot ) that had singularly failed to work against smaller numbers in the previous days. To help the police the Egyptian government deployed the army alongside them as a show of intimidation. However, Al-Jazeera reported that in both Suez and Alexandria the army seemed to want to avoid open armed conflict with the protesters. By the end of the day the police had been withdrawn from the streets of the major Egyptian cities. As a result of the protests and clashes with police a number of government buildings were set ablaze, and casualties were experienced on both sides, with most being experienced by the pro-democracy protesters. Looting was also taking place, with many of the pro-democracy protesters claiming that many of the looters were either plainclothed security forces or people being egged on by the security forces so that the government could claim that pro-democracy demonstrations were destabilising the country, winning the support of the majority and thereby getting justification for a crackdown against the protesters. Instead local communities grouped together and patrolled their local areas, scaring off looters and dealing harshly with those they caught. With a lack of police on the streets there was also concern that the Museum of Egyptian Antiquities would also be looted and so the army secured the museum and was joined in its efforts by the pro-democracy protesters. On 29 January, Tahrir Square was still packed with pro-democracy supporters and ringed by army tanks. At the Abu Zabaal and Wadi Natrun prisons in Cairo , inmates attempted to escape. Wadi Natrun was attacked by an angry mob and this led to the escape of several more prisoners. Worryingly, it was claimed that "there have been orders from the very top to free known felons from the prisons, to arm them and to let them mingle with protesters." On 30 and 31 January the protests continued, although in a somewhat quieter mood to begin with. On 30 January, Tahrir Square was relatively quiet, with only a few hundred protesters gathered there. However, later that morning several thousand protesters once more occupied the square and this time they were joined by hundreds of state judges. Mubarak's administration gave orders to the army to use live ammunition, but in something of a stunning development, the army refused, stating that they were there to "protect the people". Following the army's refusal to use lethal force to clear the protesters from Tahrir Square, the government resorted to overflights of military helicoptors and two Egyptian Air Force F-16s in an attempt to intimidate the protesters. This failed and the protests continued pretty much as they had until 1 February. 1 February - "March of the Millions"
On 1 February the pro-democracy organisers called for a "March of the Millions", the stated aim of which was the march of a million pro-democracy protesters from Tahrir Square to the Presidential Palace . Although the march didn't make it to the palace itself, the call to do so brought the largest gathering of protestors to date onto the streets of Cairo and the other major Egyptian cities. Estimates of the crowd size varied wildly, with the BBC putting the number of people at Tahrir Square itself at between 100 000 and 250 000 people, Egyptian security forces claiming that 500 000 people participated in Cairo as a whole, and Al Jazeera putting the numbers protesting in Cairo at 1 million, growing to 2 million as the day progressed. In what would transpire to be a graphic example of just how much the government misunderstood the situation on the ground President Mubarak addressed the people of Egypt on Nile TV (a propaganda arm of the government) stating that he did not, and indeed never had, intended to run for another term as President. Mubarak went on to say that he would stay in office until September 2011, and also promised to make political reforms. 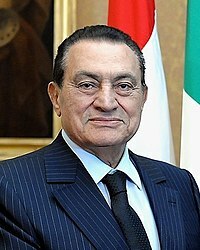 Using classic disinformation techniques that had served him well in the past, President Mubarak also said that he would demand that Egyptian authorities pursue "outlaws" and "investigate those who caused the security disarray," adding that peaceful protests were transformed into "unfortunate clashes, mobilised and controlled by political forces that wanted to escalate and worsen the situation". Mubarak was once again trying to place the blame for the unrest on the shoulders of the protesters, hoping that by doing so he could win enough support back from what appeared to be a split, almost a civil war, within the ranks of the ruling junta, by appealing for stability with the oft-used promise that he was the only one that could deliver it. Mubarak's statement was described by at least one journalist as "self pitying". By 2 February, some analysts feared that the situation could develop into a full-scale civil war . During the night of 1-2 February many of the protesters from the March of the Millions stayed in Tahrir Square , but by midday on 2 February the army was asking the protesters to leave, with state television announcing, "You have to evacuate Tahrir Square immediately. We've got confirmed information that violent groups are heading toward Tahrir Square carrying firebombs and seeking to burn the Square." Unwilling to believe state TV, and willing to fight for their position, the pro-democracy supporters stayed in Tahrir Square. The ruling party of Egypt, the National Democratic Party , arranged for pro-Mubarak supporters to march on Tahrir Square with the view to drive the pro-democracy protesters out by whatever means they could manage. In what would become known as the "Battle of Jamal", or "Battle of the Camel", some Mubarak supporters, mounted on camels and horses , and armed with swords , knives , maces , rocks , and riding whips , charged the pro-democracy supporters. Although this irregular cavalry caused casualties to their victims, the pro-democracy protesters managed to drive them off, in some cases dismounting riders and beating them before either handing them over to the army or detaining them in utility rooms in the subway system near Tahrir Square. The greatest threat to the pro-democracy supporters were hordes of pro-Mubarak supporters armed mostly with stones and firebombs . In order to boost the numbers attacking the pro-democracy protesters, security officials were witnessed bribing ordinary citizens, whilst other Pro-Mubarak supporters were off-duty and undercover police, a fact confirmed by Al Jazeera's live reports that showed some Mubarak supporters carrying police IDs. Whilst these clashes were carried out on the ground, Pro-Mubarak supporters also dropped stones and Molotov cocktails from buildings onto demonstrators below them, and gunfire was heard in Tahrir Square, although it was unsure whether this was the army firing over the head of both groups of protesters, or people from one side or the other discharging one or more firearms. It was during this time that pro-Mubarak supporters began to attack journalists , after the government spread word that the troubles had been stirred up by foreign elements, including Israeli spies . This was an incendiary charge, even in a moderate country like Egypt, and was seen as an attempt to stop international journalists broadcasting what was happening in Egypt to Egyptian citizens. Egypt's state TV had, to this point, been steadfastly broadcasting images of calm and stability, doing everything it could to underplay the depth of what was happening in Egypt's cities. During the evening and night of 2 February clashes continued between pro-democracy and pro-Mubarak supporters, with the army taking a strictly neutral role. However, and unexpected to the international journalists covering the events at Tahrir Square, the pro-democracy supporters managed to throw back the pro-Mubarak rioters and, during the day of 3 February, established a zone of control around Tahrir Square and the Egyptian Museum . The protesters bolstered their positions by barricades made from tipped-over burned-out trucks and sheets of metal. The pro-democracy demonstrators used these barricades to create chokepoints into Tahrir Square and stepped up their efforts to verify everyone entering the square, seeking to keep out the security forces who were making attempts to infiltrate the pro-democracy camp. By the evening of 3 February the deputy head of Nile TV resigned in protest over the state TV's coverage of the events in Cairo and elsewhere. Meanwhile the government continued with its almost mystical ability to completely misjudge the depth of anger and passion empowering the protesters and managed to insert yet another foot into their collective mouths when newly-minted Vice President Omar Suleiman said that the Egyptian people did not "have a culture of democracy" and that it was the Islamists and foreigners that were inciting young people to protest. In the same interview President Mubarak said that he was "fed up" with being President, but wasn't quite ready to step down because the moment he did the Nazgûl Muslim Brotherhood would take over, actually getting something right in all this mess. On 4 February protest organisers, in an operation billed as the "Day of Departure", planned a march on the Presidential Palace at Heliopolis and demanded that Mubarak step down immediately and relinquish his powers. Two million Muslims flocked to Tahrir Square to take part in jumu'ah , with about a million actually being able to enter the square itself, whilst Coptic Christian and other pro-democracy supporters formed a human chain around them to protect them from possible disruptions by pro-Mubarak forces. Although protesters in Cairo didn't manage to march on the Presidential Palace, over a million more protesters gathered in Alexandria and, in response to previous attacks against their brethren in Cairo , promised to march to Cairo if the government used violence against the protesters there. Protests also took place in Aswan , Asyut , El-Mahalla El-Kubra , Giza , Ismailiya , Port Said , Rafah , Suez , and Zagazig . Violence continued against journalists, both foreign and local, and Ahmad Mohamed Mahmoud of Al-Ta'awun was the first journalist to be killed covering the protests. The day finished with President Mubarak continuing to refuse to step down. On 5 February things quieted down a little from the day before. The army's position towards the pro-democracy protesters hardened, with the head of the army meeting protesters and asking them to go home, while other army officers unsuccessfully attempted to dismantle the barricades that the pro-democracy supporters had put up and pro-democracy supporters formed human chains to stop army tanks occupying Tahrir Square. Clashes still continued between pro-democracy and pro-Mubarak supporters, though the number of clashes was much reduced compared to previous days. Organisers of the "Day of Revolt", "Friday of Anger", "March of the Millions" and "Friday of Departure" marked 6 February as the "Sunday of Martyrs". In reciprocation of Friday's events, Coptic Christians held morning mass in Tahrir Square whilst Muslim and other protesters formed a human chain around them to protect them. Prayers, including Salat al-Janazah were held for those killed in the protests, and a marriage was conducted in Tahrir Square itself. “”First of all my sincere condolences for all the Egyptians that lost their lives. I am really sorry for their loss, none of us wanted this. We were not destroying things. We all wanted peaceful protests, and our slogan was no to vandalism. Please don't turn me into a hero. I am not a hero, I am someone that was asleep for 12 days. The real heroes are the ones that took to the streets, please focus your cameras on the right people. I am ok. (sic) God willing we will change our country, and all the filth that was taking place in the country has to stop. Together we will clean this country. Re-energised by the events of the previous night the organisers of the protests called for 8 February to be known as the "Day of Egypt's Love". With numbers that rivaled the March of Millions and Friday of Departure, pro-democracy protesters started to protest outside outside the Parliament , the Shura Council and the Council of Ministers , as well as continuing to occupy Tahrir Square . Journalists also gathered at the Al-Ahram headquarters, the state-owned newspaper, to protest against the government's actions, corruption, and a lack of freedom for the press. The 8th of February also saw the first strikes in Egypt associated with the actions of the pro-democracy protesters. The protests continued into 9 February, with protesters now setting up camp outside Parliament. The Cabinet Officers in Cairo were evacuated and more strikes sprang up throughout Egypt as unions demanded higher wages and better working conditions for their members. The government's response to this was to warn the protesters of a military crackdown if the protests were to continue. This had no effect on the pro-democracy protests which continued into 10 February and saw both lawyers and physicians joining the protests, as well as an increase in the number of strikes in the national industries. As word was received that Hosni Mubarak would give a statement at 20:00 GMT / 22:00 Cairo Local Time expectation grew both amongst the protesters and within the international community that the President was to announce that he would step down. As the state of excitement grew throughout the day, more and more people joined the protesters in Tahrir Square , ready to watch the President's speech on the giant screen that had been in the Square for a number of days. Somewhat characteristically for the President, the speech was given forty-five minutes late and highlighted just how far behind the curve the government was. Mubarak said little more than what he had already "promised" in his previous televised speech. In disbelief and shock the crowd in Tahrir Square erupted, with many of the protesters waving their shoes at the screen and the crowd chanting "Leave! Leave! Leave!" early on in the speech, when it became clear that Mubarak was still unwilling to step down. After the speech finished part of the crowd at Tahrir Square marched towards the Presidential Palace. With the shock of Mubarak's non-resignation still a raw wound to the pro-democracy protesters, 11 February saw an increase in the number of protesters from the day before. The organisers called this day "Farewell Friday", presumably in the hope that if they kept on hitting the government over the head with the same message over and over again, the message would sink in. In addition to the crowds in Tahrir Square , thousands of protesters also continued to surround the Parliament and the Presidential Palace , and crowds also blockaded the state TV building. Something had to give and at about 16:02 GMT / 18:02 Cairo Local Time, it did, when Vice President Suleiman announced that the office of President had been vacated and that the military council would take over the running of Egypt. Quite unsurprisingly this announcement triggered wild celebrations throughout Egypt, celebrations that would be continued on the following Friday as a reminder to the Egyptian Military Council that the pro-democracy supporters still had their eye on them, and expected real change. On 15 February the Military Council announced that a new constitution would be adopted within 10 days. ↑ http://www.spiegel.de/politik/ausland/0,1518,742498,00.html Anarchie in Kairo "Mubarak will Ägypten brennen sehen"
↑ http://edition.cnn.com/2011/WORLD/africa/02/02/egypt.pro.mubarak/ Who are the pro-Mubarak demonstrators? This page was last modified on 21 September 2018, at 22:26.